Digital cameras are changing quickly so getting the best camera for your money is very important. This has been a dream camera to use. I confess I tend to shoot in Auto (no flash) almost all of the time as the camera is so intelligent. It's so fast and responsive and the picture quality is stunning - always - even in poor light. I also bought the Nikkor 18-200mm zoom lens and with that combination I'm unstoppable! I can take a wide angle landscape shot, then zoom right in without changing lenses like my friends. Fast start up, excellent picture quality and brilliant zoom. It is easily possible to get an extremely good compact digital camera for well under £200, and a digital SLR camera for upwards of £350. Do not get obsessed by how many mega pixels a digital camera has as many camera buyers do. It really depends on what you plan to do with your digital photos. If you are only going to keep your photos in an online gallery then a cheap 2Mp or 3Mp digital camera is adequate. However, if you plan to print them at 7"x5" size or larger you should look for digital cameras of 4Mp upwards. If you are going to crop into your photos then a 5Mp+ digital camera is best. Check online or magazine reviews of digital cameras, or get down your local camera shop to check how long each camera takes to start up. You don't want to miss those great spontaneous shots do you! For me, this is one of the most important consideration when buying a digital camera. I trawled through loads of reviews looking for the fastest digital camera as I didn't want miss the perfect wildlife or candid portrait shot. My advice: get the largest memory card you can afford. I have a 4GB card in my compact digital camera and a 8MB in my SLR. On a recent trip to Morocco I was still taking pictures long after my jealous girlfriend's 1GB memory card became full. Digital cameras are getting smaller and smaller which is great for travelling in places where you do not want people to know you have a camera, but do watch whether the functionality has been reduced. Most digital cameras now include pre set modes for shooting which are great for beginners and professionals alike. Look for modes such as Night, Indoor, Sunset, Sport and Portrait for those great shots of people with blurred backgrounds! I became obsessed with finding the best cheapest digital camera, and this is where I found it. Plus cheap digital camera accessories and memory cards. Scans prices from all the major digital camera specialists. 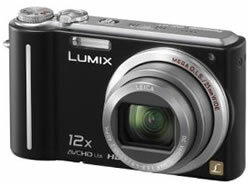 Follow the links to read about each digital camera.